On our travels, we went to Detroit Rock City and visited the Heidelberg Project. Here is a small selection of the photos we took at this amazing place. We took over 100 photos and that wasn’t enough. Everywhere you look there’s art. Just as you finish photographing one piece, you see another. It’s like an enormous art installation that spans a few blocks. We also saw evidence of Tyree’s work through out the city. A dot here, a painted clock on a door there. 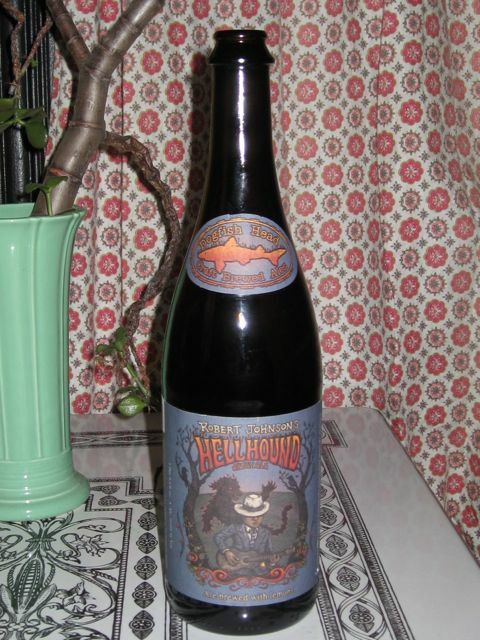 The good folks at Dogfish Head Craft Brewery sent us home with this awesome brew, Robert Johnson’s Hellhound. 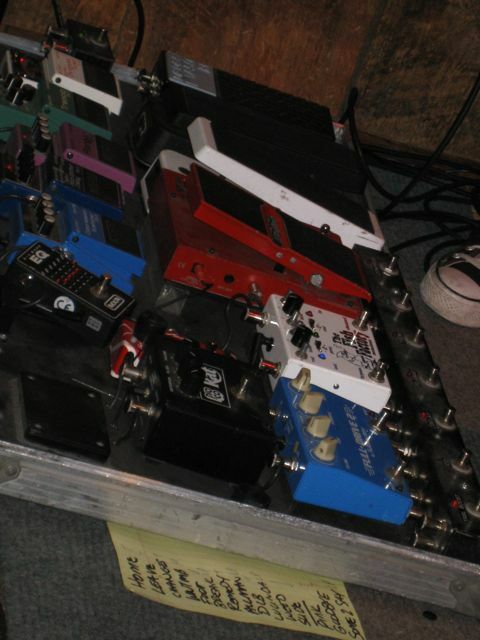 We want to thank Dogfish Head for inviting us to be part of the 2011 Analog-a-go-go. 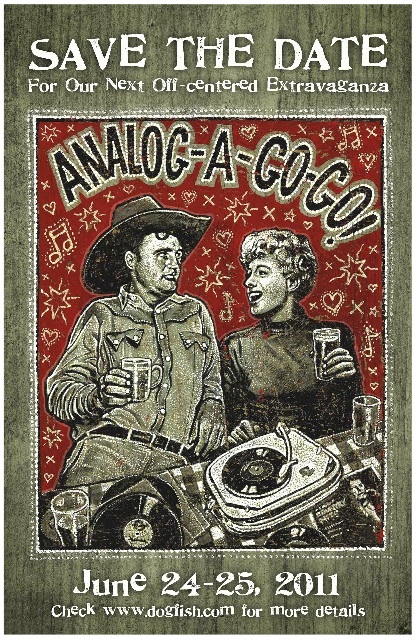 We’re looking forward to 2012 Analog-a-go-go! Hope to see you there! 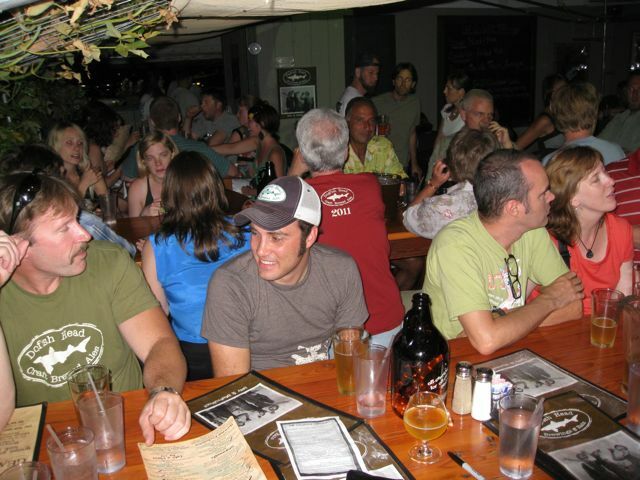 Sam Calagione, Founder of Dogfish Head Craft Beer and Sid Vintage. Sam’s wearing a vintage 1982 “Fast Times at Ridgemont High” t-shirt from Sid Vintage. 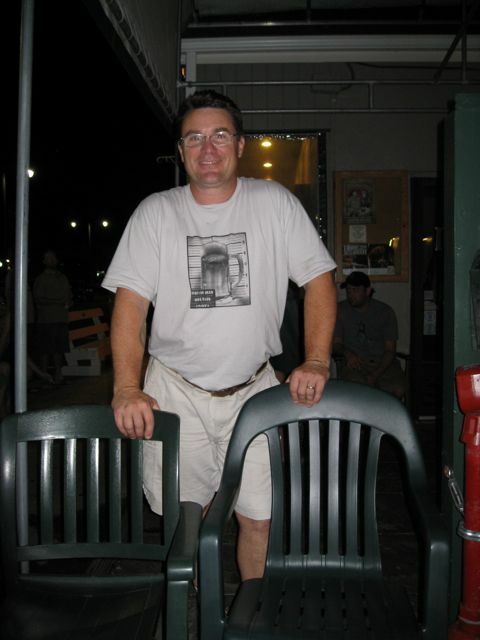 I’m wearing the Dogfish Head Analog-a-go-go t-shirt. Sam Calagione signing the Analog-a-go-go poster. Jon Langford, who did the artwork for the poster, signed it for us the night before. We’re going to frame that poster and hang it in the store forever! 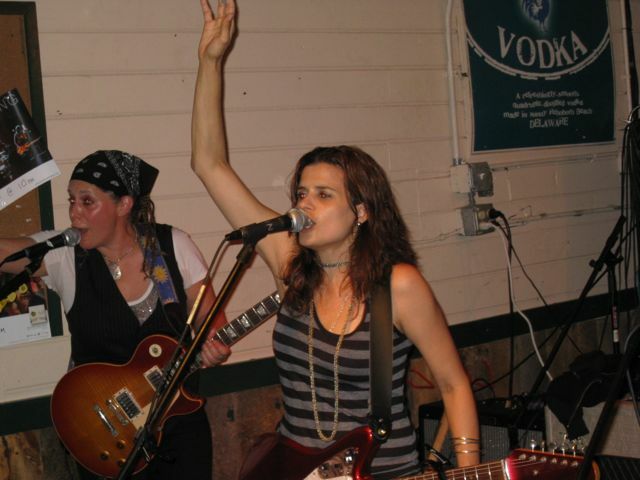 Closing out the Analog-a-go-go event, Antigone Rising played at the Dogfish Head Pub in Rehoboth Beach. 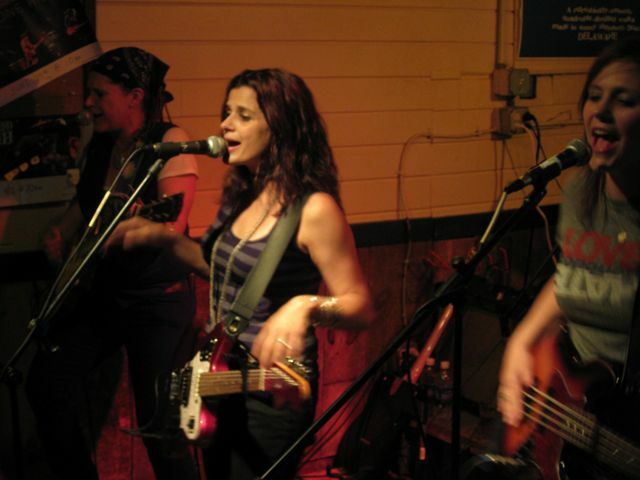 Antigone Rising played songs off the new CD, “23 Red” coming out in August. Kate Schutt opened the show with her amazing guitar playing. Dogfish Mike greets us as we arrive to the Dogfish Head Pub. Here’s a group photo on the deck at the pub. Me with Heidi Lowe and Mark Carter. I’m wearing the Dogfish Head Analog-a-go-go t-shirt and earrings by Wesley Glebe from the Heidi Lowe Gallery, and Mark Carter is so awesome, he’s wearing a Sid Vintage t-shirt. 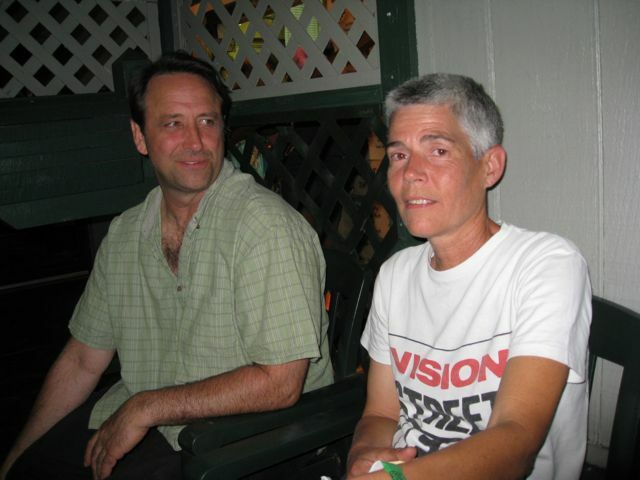 Jill (wearing a vintage Vision Streetwear t-shirt from Sid Vintage) is sitting outside with Brad from Grain Surfboards. 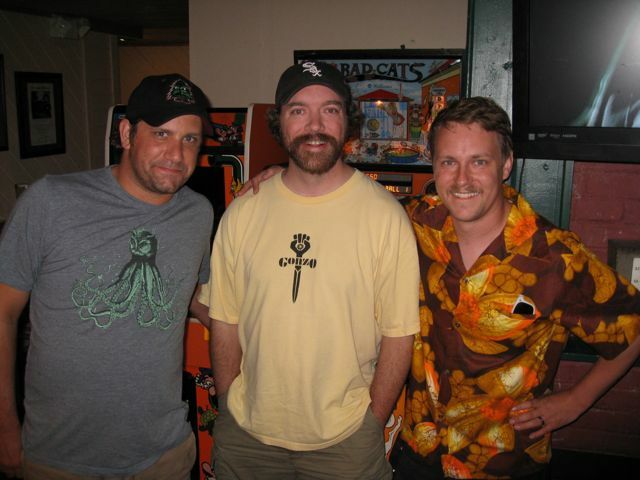 Max, Todd and Rob from Go West T-shirt Company. They print all the Dogfish t-shirts. Rob is wearing a 1960’s vintage Hawaiian Shirt from Sid Vintage. 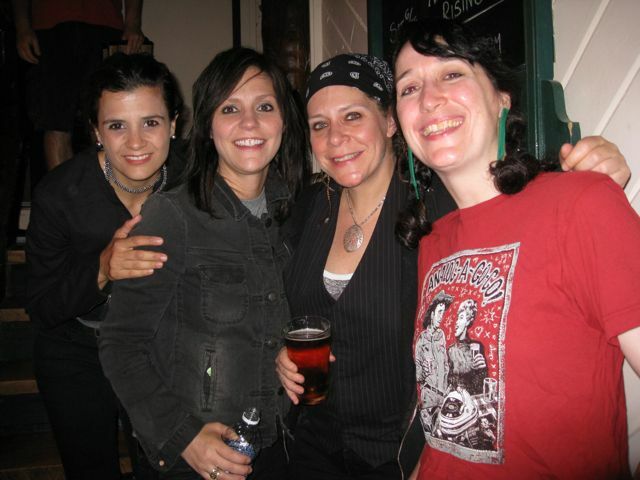 Me with Antigone Rising who was performing at the Dogfish Head Pub that night. Saturday, June 24th we headed over to Dogfish Head Craft Brewery in Milton, DE to set up shop for the 2011 Analog-a-go-go! We were right next to the famous SteamPunk Tree House, which is an amazing work of art to see in person. You can go inside, there’s a balcony and spiral staircase, very cool. I still don’t have the photos, so check out the links to get an idea. I’m still working on retrieving the photos. Hopefully I’ll have them for you soon. Across the way was Heidi Lowe of Heidi Lowe Gallery which showcases incredible art jewelry. Other awesome vendors there were Grain Surfboards who make wood surfboards by hand, Other Music located on E. 4th St. NYC, Rockstar Glassworks hand blown art glass, ASM Skateboards who made a Steampunk Treehouse Skateboard, David Plunkert who is an amazing artist was selling prints and other cool stuff, Rainbow Music and Books, and much more. We had lots of misc. Vintage T-shirts including concert tees, 50’s-60’s Hawaiian Shirts, vintage surf shorts, Vintage Leather Belts and vintage sun dresses from the 40’s thru the 8o’s, tooled leather shoulder bags from the 1940’s thru the 1960’s and more. We spent most of the day at the beach. Later in the evening we headed to Dogfish Head Pub for dinner, beer (Raison D’etre) and a show, Jon Langford and Skull Orchard! They were Freakin’ Wicked Awesome! We bought the Johnny Cask T-shirt, which is illustrated by Jon Langford. He also did the artwork for the Analog-a-go-go Poster which he signed for us. We bought the Jon Langford & Skull Orchard “Old Devils” CD and Jon Langford “All the Fame of Lofty Deeds” CD and some artwork which we love. 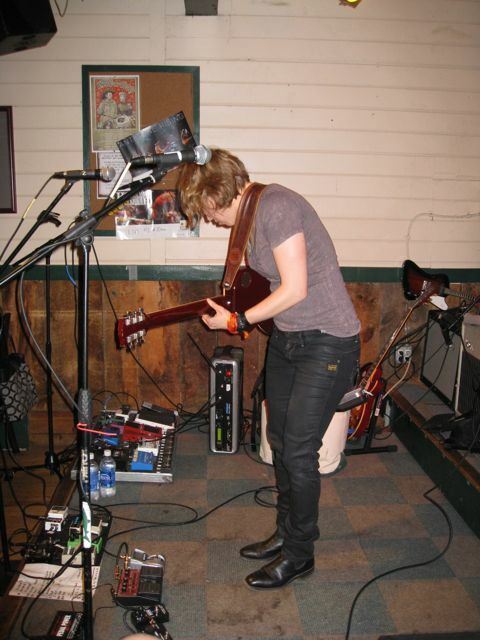 Great beer, great live music, awesome crowd, we had a great time. *due to technical malfunction, there are no photos for day 1 ,2 and half of day 3. Hopefully we’ll recover them because we have photos from the show and the event, and some of the awesome people we met. 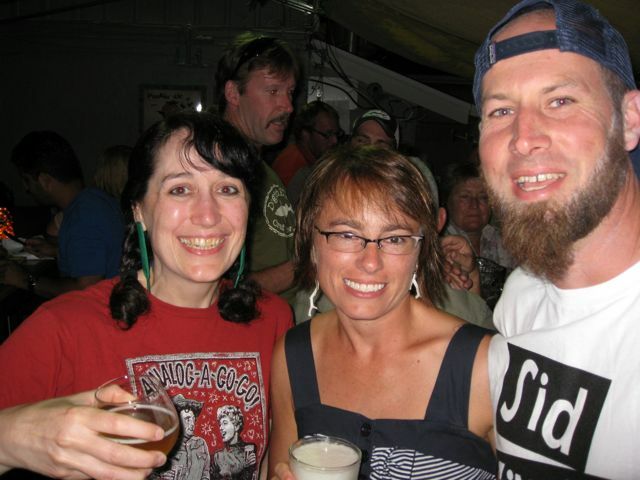 We had such a great time at the 2011 Analog-a-go-go event hosted by Dogfish Head Craft Brewery in Rehoboth Beach, Delaware. We want to share with you all the awesome people, music, art and fun we had. We lost our photos from the first few days, so we’ll do our best without them. We stopped in NYC for a fashion day on the way. When we visit NYC we always go to our favorite Bed and Breakfast in Chelsea, Dupuy’s Landing. Walking around Chelsea, we went to Comme de Garcon, one of our favorite designers’ store on 22nd St. Just a little further down the street we came upon Balenciaga. We went to the Hudson River Park to check out the new SkatePark. From there we headed toward the old Meat packing district on 14th St. where we saw a fashion photo shoot for Bloomingdales. On 14th St. we went to Diane Von Furstenberg, Stella McCartney, and another favorite, Alexander McQueen! After our mini designer tour in Chelsea, we headed to the East Village to check out some of our favorite vintage shops. Our pick of the day was Village Style on E. 7th St. It was very hot and humid that day so we didn’t go to as many shops as we would have liked. Sid Vintage is going to Dogfish Head Craft Brewery! Voyage to Dogfish Head Craft Brewery and Dogfish Head Brewings & Eats in search of cask-conditioned ales and classic vinyl for our ANALOG-A-GO-GO Weekend. We’ve got a diverse and awesome line up of artisans on board for the weekend. Vintage clothing, custom bikinis, handcrafted jewelry, sustainably harvested cedar surfboards, beer memorabilia and LOTS of VINYL. The full spectrum of music will be represented! There’ll be VINYL for everyone….from the virgin record buyer to the seasoned collector. Dogfish will ensure that the off-centered ales are flowing and Bethany Blues will have the smoker cooking up some delicious BBQ so come out and be part of this off-centered Analog Weekend. The ole’ cask beer festival, vinyl swap, and artisan fair at Dogfish Head Craft Brewery (Milton). Check out the vinyl sellers and artisans below. For over 15 years, Other Music, located on 15 East 4th Street & Lafayette in New York City, has served as the one-stop record shop for New Yorkers and visitors from all around the globe seeking out underground, rare and experimental music. Specializing in rock, jazz, electronic, international, and psychedelic and countless other genres, the store is known for its staff recommendations and its weekly email Update, which reaches over 30,000 subscribers worldwide. Rainbow Music & Books (www.rainbow-online.com) New & Used Vinyl, CDs, DVDs, and Books. Newark landmark for almost 35 years. Now located behind Switch Skate & Snow at 54 E Main St (up the alley). A collector of Vintage Vinyl and Beer Memorabilia. A Collector with a wide variety of records from all recording eras and genres and two Edison Phonographs with cylinder records from the late 1800s and the early 1900s for sale. Vintage Clothing with an Edge. 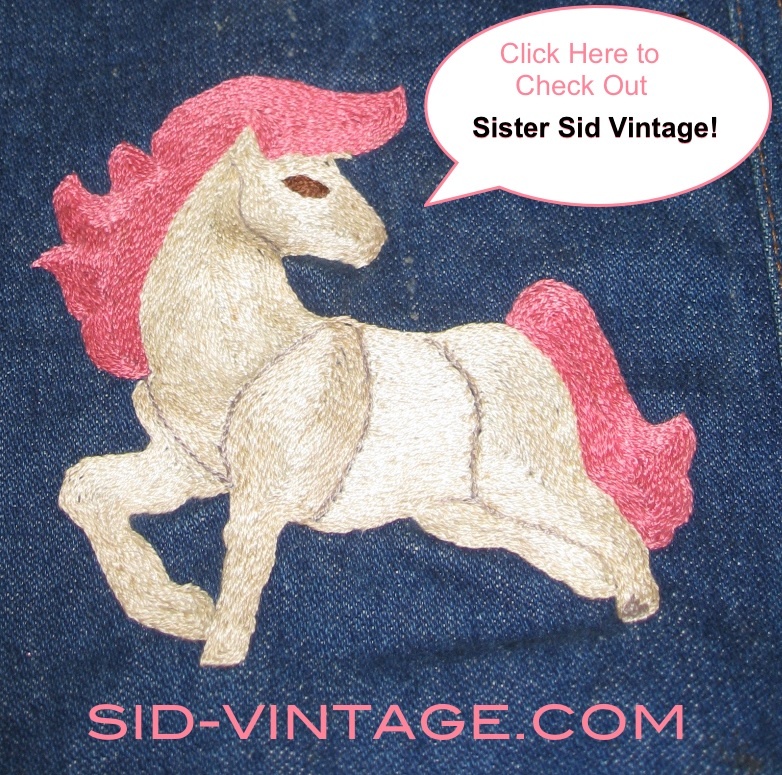 Sid Vintage is a retail store in downtown Northampton, MA. 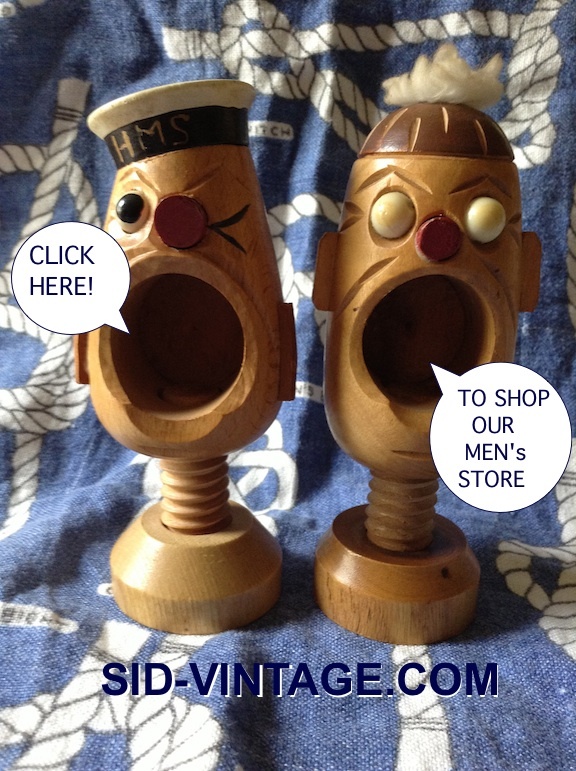 Their selection of vintage clothing and accessories has been carefully chosen for quality and authenticity. They are best known for their t-shirts, leather jackets, boots and belts. Hand-built in Maine. Sustainably harvested cedar surfboards. Heidi Lowe Gallery is an innovative jewelry studio and gallery founded in 2005 by artist and gallery owner, Heidi Lowe. The gallery features handmade, contemporary jewelry by studio artists from around the world. This results in an eclectic blend of jewelry. The represented artists are investigating ideas within but not confined to the field of contemporary art, the body, and culture. The art work utilizes jewelry as either the subject or the format. We exhibit six shows a year including two solo shows and four group shows. The gallery is constantly transformed through the layout and display methods which are influenced by the works being shown. Each exhibition is treated as a piece of art work, every detail is carefully considered to convey the intention of the exhibition. While hanging out, grab some delicious BBQ smoked onsite from Bethany Blues (http://www.bethanyblues.com/). • Analog keepsake “mini English pint” to try those tasty Cask ales. • A raffle ticket to win the recently released Robert Johnson Commemorative Box Set. • An opportunity to visit the Steampunk Treehouse. • Access to purchase, swap, barter, trade and enjoy some classic vinyl and various artists works. Tickets will go on sale at http://www.dogfish.com at Noon on Wednesday MAY 18th. Only 400 tickets will be available, so get them quick.